A few months back, I shared the story of what we went through this past fall — The Day We Lost Everything. If you haven’t read that, it details how we ended up losing our home and most of the stuff in it to a major mold issue. We had been slowly feeling worse — brain fog, repeated sinus infections (for me), the kids were popping up with random fevers and were fussy, and we could not figure out why it was happening when we were trying to eat so well and be so careful. Things just kept getting worse…. Ultimately, we found a large amount of black mold in the basement, underneath some piles of items. We had the house tested, and counts were in the thousands on all floors (normal counts are in the low hundreds or less). We knew the house was very, very dangerous and the safest thing to do was to leave. So we did. On August 16th, we packed up the kids and very little else. I had purchased some new clothes and underwear from the thrift store and Walmart (respectively) and packed them away in our car. When we arrived at my parents’ home, we removed all our clothes and set them outside in a bag, later to be thrown away, and changed. We had 1 – 2 outfits each, and not a whole lot more. We spent a month living with my parents, about two hours away from our home and our lives. Ben (my husband) telecommuted to work most days and drove down to the office twice in that month for meetings he absolutely had to be present for. We dealt with a lot of stress, fatigue, and other issues related to healing from the mold exposure. The first week or so was the hardest, health-wise. We drank a lot of freshly-pressed juice, a lot of kombucha, and we ate grain-free and sugar-free for a while. Any “backsliding” made my anxiety flare terribly. After three weeks, we knew that we needed to find a place to go, that was near our lives so that we could get out of my parents’ hair (they were so gracious to let us stay) and be present for our normal activities again. We began to search for apartments in our area. Most of the places were more expensive than we could afford, given that we were (are) still paying the mortgage on our other home, as we clean it all out (yes, that process is still going on, although it’s nearly finished now). We looked all over the city online, and when I was local, I drove around to look too. Finally, we found a place, online. I checked the website to look at photos, and I read reviews of the place. It wasn’t anything fancy, and it was significantly smaller than our other place (3 bedrooms and 1100 sq. ft. instead of 4 bedrooms and 1800 sq. ft.) but it was what we needed at the time. We ended up signing the lease without ever touring the place. We moved in on Friday, September 12th. After that, it was slow progress to continue to replace things. I had bought a lot of necessities while I was with my parents — towels, sheets, blankets, clothes — but there was a lot more to buy still. We had no beds. No furniture. No food, including pantry staples. It took us about two weeks to buy most of what we needed. We were lucky, and several friends and church members offered us clothes for the kids, a couple pieces of furniture, and other small items. Right away, we bought the kids beds, including a really nice bunk bed frame for our older two boys (seriously — we got a great deal on it on Craig’s List!). We got the kids dressers. It took us almost two months to get our own bed (which we purchased through My Green Mattress) and we still don’t have our own dressers…but at least the kids have what they need. I’m still working on sewing a new cloth diaper stash, and on getting back to all-homemade food, but at least it’s better than it was. My parents were wonderful and gifted us a beautiful, large (7-qt) crock pot, so we’re back to making stock. A friend gave us a SCOBY and we’re brewing kombucha. It’s happening…slowly. We were lucky, and our unit has a small laundry room right on the main floor. We got a great deal on a washer and dryer, really heavy duty ones, on Craig’s List (yeah, we got most things from there). They’re actually better than what we had before…and cost less…and I do love having the laundry right there! It makes it so easy to do. No more carting heavy baskets up and down two flights of stairs! I can’t say we’re back to where we were yet. I don’t know that we’ll ever be 100% back to where we were. Too much has changed, now. But at least everyone’s health is back on track, and we have a safe place to live. It was mildly nerve-wracking when, a week after we moved in, we realized that the carpet in the living room was wet…argh! It turned out a hose had gotten knocked off in the utility room. Maintenance put it back, and we pulled up the carpet and put fans on it and dried it all up very quickly. No more will we ignore water…no matter how minor it seems! Our old home is almost completely cleaned out (we just have to remove the last stuff and scrub floors and walls) and then we’ll be ready to sell. We have a realtor who specializes in distressed properties, so he’ll handle the sale for us. We hope to have the house gone by January, at which point we’ll finally, really be able to move on. My husband’s health is still struggling more than the others because he’s been the one cleaning out the house and getting regularly re-exposed. So once that’s done then he’ll be doing a major detox to get rid of all of the junk in his body. The truth is, a lot of this was really a blessing. We had been wanting to get out of that house, and we felt like we had no “out.” We were stuck, for months or years, until our situation somehow changed. Finally, we were forced to get out, and now we have so many possibilities open to us. Once we sell the house (to rehabbers) we’ll be debt-free. That’s a pretty big blessing, too. Scaling down is a blessing as well. Yes, we have less storage now and that’s occasionally frustrating. But there’s a lot less space to keep clean, and a lot less “stuff” to take care of, so it’s much easier to keep the house clean. It’s basically clean every night when we go to bed (although I can’t promise that if you stopped by in the middle of the day that it would be — there’s a good chance you’d find toys all over the floor!). I like clutter-free places but I don’t like spending my entire life cleaning, so this has been a blessing. We ended up in a really nice area. Upon driving around, we realized that most of our favorite stores — Costco, Aldi, Earth Fare, Meijer — were within a mile or two. Plus, the post office, BMV, our bank, coffee shops for me to work, thrift stores, the library, nice parks, and more. I never thought we’d find an area that was so close to so many things we used as where we were before, and this is actually better. I had no idea what was around when I picked this new home, so we got really lucky. Our health is much improved. Just being away from the mold helped so much. After a few weeks, I noticed my mind clearing and my ability to think becoming much better. The kids’ energy levels rose and they haven’t really been sick since we left. Our youngest’s struggles with his digestion and diaper rashes have disappeared. Not knowing, for so long, what was causing all of these issues was so frustrating — it seemed like no matter how hard we tried to do all the “right” things, we were getting worse. But I know now that all of those things I did kept us from getting sicker than we did, and helped us significantly in getting rid of the mold once we were out. It protected us. That is all a blessing too. We were blessed directly by so many people reaching out to us and offering to help. Several people, including some we barely knew, offered us clothes, diapers, and other items we needed. Our church gave us a couch and a chair they no longer needed. We found out how many people really care for us, who were willing to stand up and reach out to us when we were in need. We were so grateful for their help. Yes, it’s been a long and sometimes frustrating process. But we’re really so grateful for the many blessings that have come through all of this. And for the freedom we feel now, to make different choices and to take our lives in a new direction. That we don’t feel stuck in the “regular” way of working normal jobs and having a normal home and never achieving our dreams. We know now that we have options as we move forward — and that is so awesome. Through all of this, there was one more blessing that came, a bit unexpectedly, but with much excitement. Yes…that is what you think it is. Our next wonderful baby, our fifth, will be joining us sometime in June, 2015! There are so many blessings that have come through this. Truly. We are very grateful. 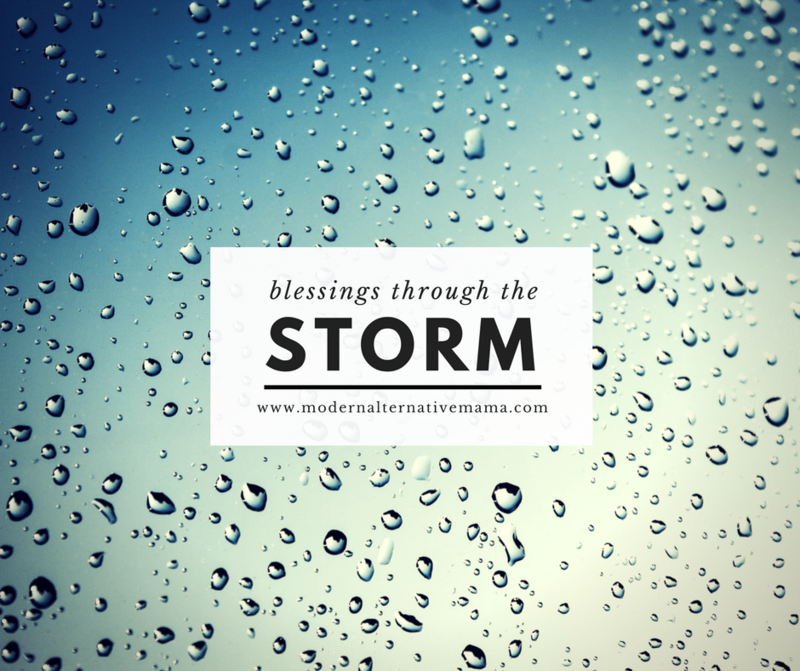 Have you ever found blessings through a storm in your life? Congrats on your new baby news! A true blessing! 🙂 So glad to hear your family is getting their health back and so many have reached out to help you. God bless your family. Congratulations! I’m expecting June 2015 with my husband and my first! I am so glad you are doing better! It is wonderful that you are able to see the positive in such a serious situation. Congratulations on the new baby. I didn’t know about the mold issue but glad you’re feeling better now. I didn’t know you couldn’t wash and wear the clothes as I know I would’ve did that. You couldn’t use any glass, SS, or cast kitchen items either? I know I could never throw those out and they don’t absorb things. Hope you sell the house soon, but know it cna take a LONG time to do. Twice we paid mortgages on 2 houses at once on 1 income. Not easy but doable. fortunately it didn’t take long to sell. Hope everything keeps going well. Congrats on the new baby. I didn’t know about the mold issue but glad you’re doing better now. I would never have thrown out clothes and Ss, glass, or cast kitchen items as they don’t absorb. never heard you couldn’t wash and keep those items. I couldn’t afford to replace an entire house but glad you were able to. We paid two mortgages at once twice on two homes on one income. Not fun and we were lucky it didn’t take lomg. Will the mold affect folks’ decisons to buy your old home? I hope it goes well and sells soon. good luck. Thank you for the posts on your mold. Because of the posts, we tested our mold and it was black mold. We have since moved to a new place. Our homeowners insurance is covering our expenses and the repairs to our house. Thank you for sharing!